As much as content marketing is a “pull” and not “push” method of marketing, just because you build it, doesn’t guarantee consumers will come. 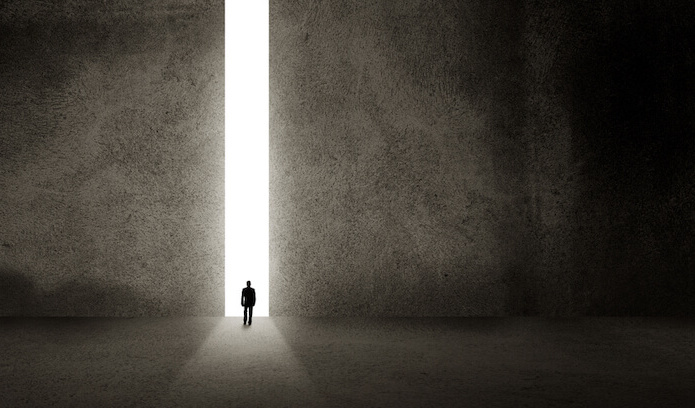 Having the data to target the right audience, with the right content, in the right place, at the right time, is a large part of why 78% of CMOs think custom content is the future of marketing, and it’s the reason why brands are shifting budgets into content marketing at a faster pace than ever before. But where is this data coming from and how are brands using it to move consumers from awareness and consideration to conversion and ultimately loyalty? Here are four ways brands are leveraging Outbrain data-rich targeting capabilities to drive results with content. Visiting a brand’s website is probably the strongest indicator of a consumer’s interest in a product or service, which is why retargeting brand website visitors has been one of the most effective digital marketing tactic of the past decade. At the beginning of 2016 Outbrain introduced Custom Audiences, marrying content marketing and retargeting for the first time, and enabling marketers to re-engage their website visitors with valuable content, recommended across the Outbrain network of premium publishers, in order to keep the conversation going or drive to action. Leading home décor retailer One Kings Lane has been using Outbrain to promote its online magazine Style Guide, and is now leveraging Custom Audiences to increase its ad spend efficiency and conversions. By targeting Style Guide visitors across the Outbrain network of premium publishers like, Better Homes and Gardens and Southern Living, One Kings Lane managed to hit their return on ad spend (ROAS) target and increase their conversion rate 4X, all with a 50% lower cost per acquisition (CPA). 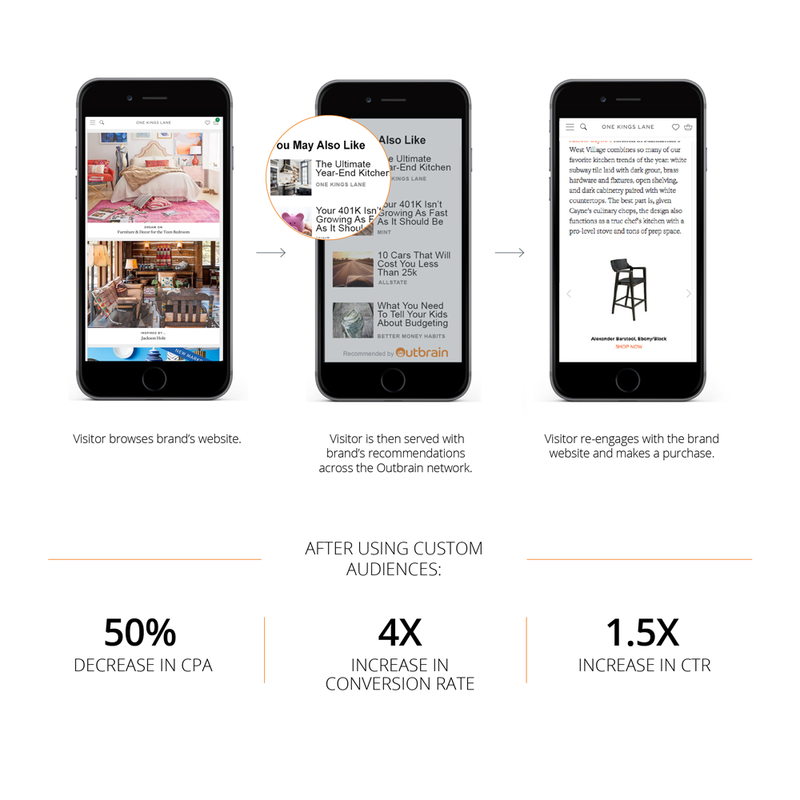 The Outbrain integration with BlueKai and LiveRamp, gives brands the opportunity to use data to further target their content recommendations across our network. With 82% of marketers planning to increase their usage of 1st party data this year, integrating Data Management Platform (DMP) audience segments into content targeting has become the next competitive advantage. Outbrain will soon give marketers the ability to leverage their customer databases (CRM) such as lead lists and customer emails to target audiences with online content. 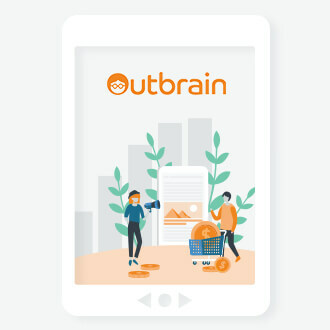 Because Outbrain reaches of over 600 million people worldwide, we’ve seen very high match rates between the Outbrain network and a brand’s customer list. In many cases, we’ve been able to reach over 50% of marketers’ CRM databases; a higher match rate than almost any other platform that offers CRM targeting. Much like the Facebook custom audience or Google customer match feature, marketers will be able to recommend different content to different customer segments, allowing content marketing campaigns to achieve customer retention goals, as well as customer acquisition and brand awareness goals. Telling the right story to consumers is the most essential part of a brand’s content marketing strategy. What makes a story the “right” one? It is cohesive, consistent, follows a pattern that is unique to the brand and is aligned to the customer journey. 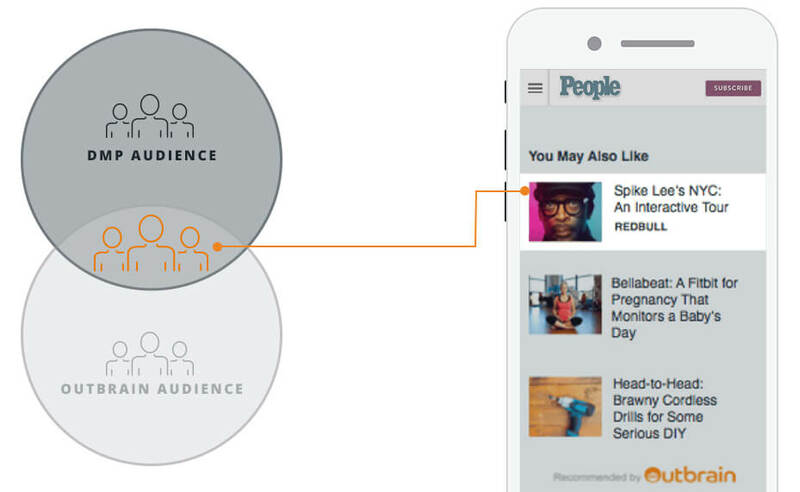 With Outbrain Story Sequencing, you can use behavioral data to control the sequence in which a user engages with multiples pieces of content. 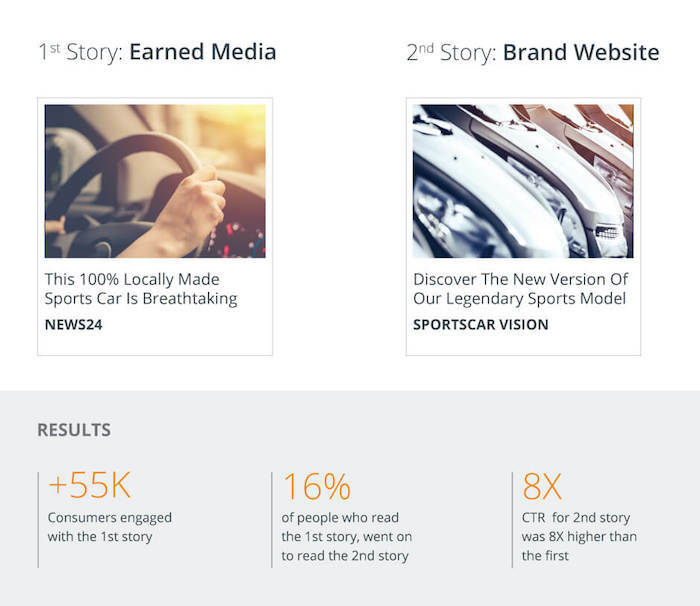 Brands often choose to start their story with a piece of earned media like a review from an influential blogger or press coverage from a product announcement. This allows brands to architect a content experience that is measurable at every stage, even if some of those content pieces are not owned. A major auto brand did just that by first driving over 55K readers to a piece of earned media about the release of their premium sports car, and then recommending those who read that piece of press coverage a different article from their brand website that went into more detail about the new features of the car. 16% of those who read the first article, clicked on the second article, an 8X increase in engagement rate when compared to those who were not exposed to the first article. Brands understand that a prerequisite to succeeding with content marketing is creating content that tells the right story for their target audience. However, the brands who are winning the battle for attention understand that great content is only half of a successful content marketing strategy. Ensuring content is discovered requires data and targeting. Our new campaign dashboard brings together both. Watch a video about the launch of our new Amplify dashboard. To recap, here are four ways brands are using Outbrain targeting to deliver brand results with content marketing. Get in touch to speak to one of our experts and learn all about our targeting capabilities. 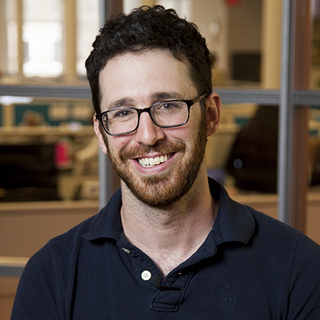 Lior is a Product Manager at Outbrain Amplify. He's just a city boy, born and raised in South Detroit. He took the midnight train going anywhere. One day, he will have the man-cave he always dreamt of. Thanks for this article! I’ve always gone by the rule that you should spend as much time promoting your content as you do creating it. These are some really good suggestions for doing that!